Where was the business press in the weeks and months leading up to the deepest financial crisis since the Great Depression? As our economy unraveled, journalists struggled to keep up with the story of the century, grappling with an alphabet soup of derivatives, backroom deals, and toxic financial instruments. But many fault the media itself for having helped to create the bubble in the first place. Did the press fail its mandate as an engine of truth by buying into the hubris and exuberance of the preceding decades? 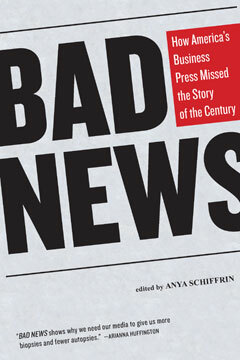 Bad Newsis a foundational text for navigating a controversy that will be studied for years to come. With contributions from leading journalists and academics—including Nobel Laureate Joseph Stiglitz, Columbia Journalism Review’s Dean Starkman, and Huffington Post business editor Peter S. Goodman—this collection presents a complex debate in a highly accessible format for anyone from curious readers and scholars to journalists themselves. And ultimately, the questions it raises illuminate the heated debate about the media’s role as guardians of our democracy.